A team of exometeorologists at MIT have calculated the size of the snowflakes that fall onto the polar regions of Mars in its winter, and it turns out that they’re pretty tiny. 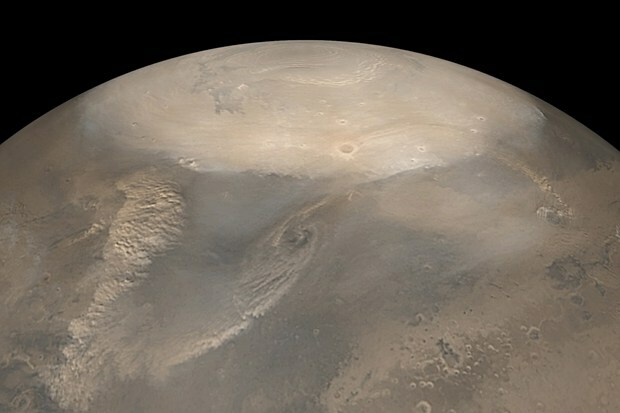 Mars’ weak atmosphere is comprised almost entirely of carbon dioxide, and during the chilly -87C winters on the red planet, it gets cold enough for particles of snow to form. Except that it’s not snow as we know it, which is made of water crystals. Instead, it’s dry ice — frozen crystals of carbon dioxide. To work out how big the particles are, the team first estimated the mass of snow deposited at both poles by measuring tiny changes in the planet’s gravitational field over the seasons. Using this mass, and physical characteristics of carbon dioxide crystals, the team was able to determine the number of snow particles in a given volume of snow cover, and from there the dimensions of the particles.